← What a Joyful Sound Those 15 Young Handbell Ringers from Gotha, Germany Made! Nails is an Army veteran. He says he served our country during the Civil War, but he was really stationed in California during the late 1950s. Being drafted provided him with many character-building opportunities. We think three of the best results of his Army service are his becoming good friends with a butcher from Medina, his chance to be an extra in the Sandra Dee movie, “A Summer Place,” and the discounts at Lowe’s and Sears to which he is now entitled. Yesterday, we took our resident veteran to Veterans & Military Day at the 158th annual Ohio State Fair. After the ticket-takers provided Nails with free admission and thanked him for his service to our country, we passed a neat Civil War encampment and started our day at the DiSalle Creative Arts Center. Inside, we saw a 500-pound chocolate pig and piglets, decorated cakes, dollhouses, a rug-hooking demonstration, and many fine examples of quilting and needlework. We also took home a couple of clever make-and-take doll face pins for a friend’s mother to share and embellish with her granddaughters. After a stop at the Heritage Crafts building, we made our way to the Dairy Products Building, where we saw the butter cow and calf, as well as this year’s butter sculpture: a space shuttle and astronaut, in tribute to the shuttle program. Lunch featured the celebrated cheese sandwich (Swiss on rye). Inspired by Adam Richman and all the episodes of “Man v. Food” that we’ve been watching lately, Nails and I later shared a corn dog for an afternoon snack. At the Ag & Hort Building, we took an appreciative look at the home-grown gladiola and vegetables on display. 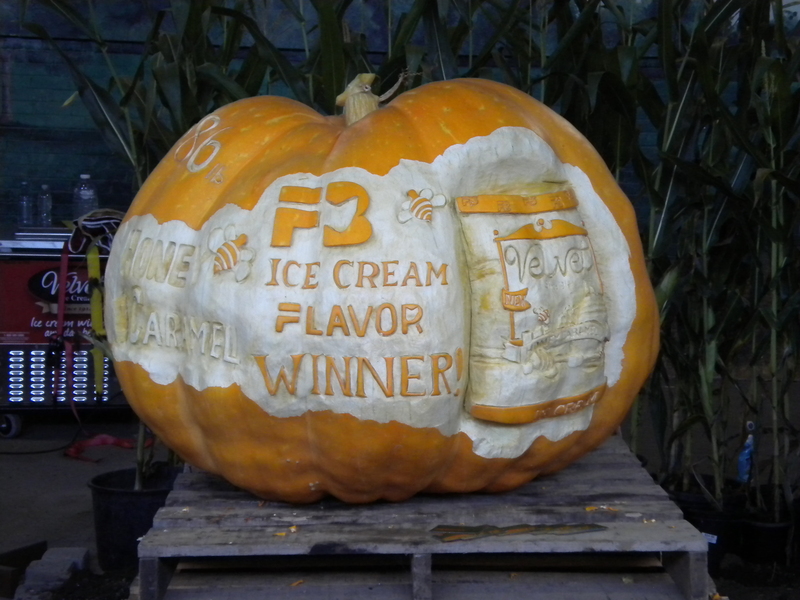 We also enjoyed seeing this year’s entries in the Giant Pumpkin Competition, with one carving featuring Velvet Ice Cream’s new flavor, Honey Caramel, a winning entry in last year’s Create-A-Flavor Contest that was submitted by an 8th grader from Williamsburg, Ohio. It was also tempting to try the Country Cruise, the Ohio Farm Bureau Federation’s pedal tractor course that introduces children to green energy, conservation practices and Ohio’s agricultural crops. Stopping by the Central Ohio Beekeeper’s Association’s booth, we saw two familiar faces from our neighborhood and learned that they keep bees in their back yard! When the heat got too intense for walking, we rode for a while on a John Deere-pulled tram that stopped around the perimeter of the grounds. With Roy, an inductee in the 2006 Ohio State Fair Hall of Fame, as our guide, we learned many new and interesting fair facts and were refreshed by his pleasant, welcoming manner. 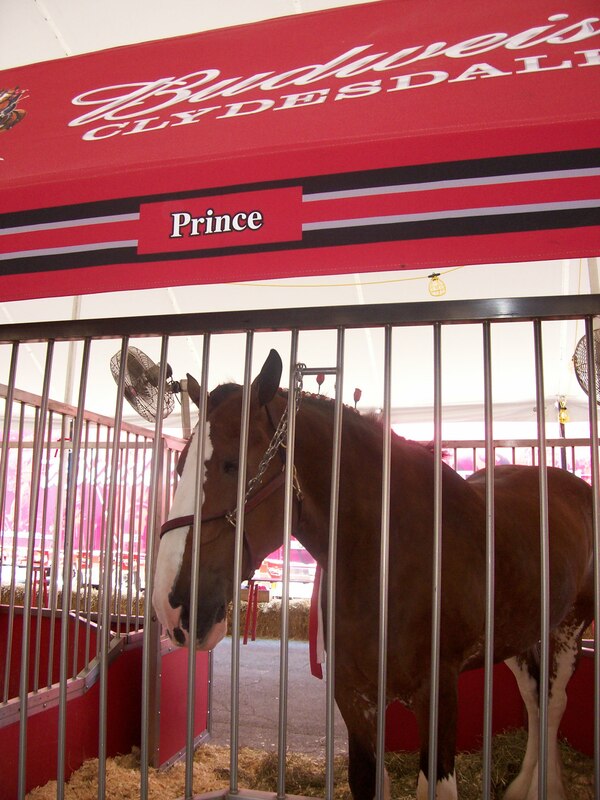 We also met two week-old calves near the Voinovich Livestock & Trade Center and made the acquaintance of Prince at the fancy Budweiser Clydesdales tent. But our visit to the Ohio State Fair was especially “Fairtastic” because we ran into Kevin, an old friend from one of our favorite families whom we hadn’t seen in years. Kevin’s parents did everything in style, such as celebrating their eldest daughter’s 21st birthday with a great party featuring hot-air balloon rides over Hoover Dam, making a needlepoint rug for their dining room to go with their Herend “Rothschild Bird” china, and owning the lovely Linden Laden in German Village. Much has changed from the days of “State Fair,” the 1945 movie that’s one of my favorite films. We didn’t see anyone dressed as prettily as Jeanne Crain or as handsome as Dana Andrews. 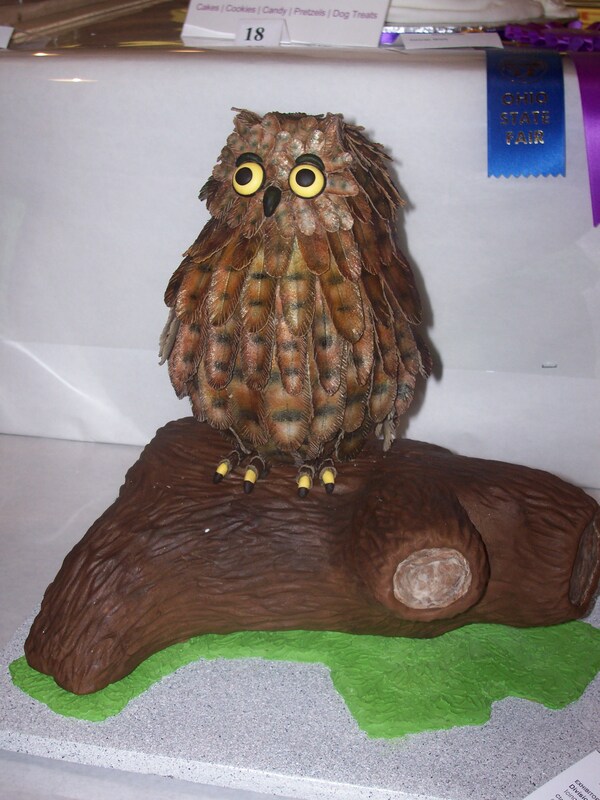 And the judging we saw was quite different from Fay Bainter’s mincemeat or a prize boar like Blue Boy. But “Our State Fair” certainly is a great state fair, and we were glad to attend! This entry was posted in Columbus. Bookmark the permalink.